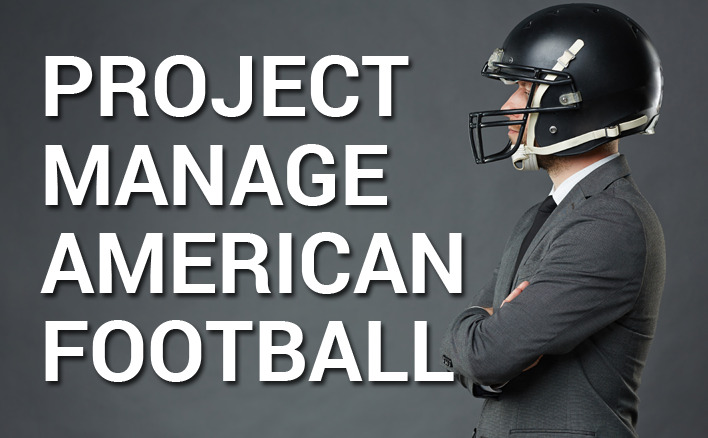 It’s Super Bowl weekend, so (naturally) we’re thinking about project management. We’re not, however, going to discuss the processes and logistics that go into organising an event like this. We’re going to outline why a football game is just like a project. How so? We hear you ask. Well, as anyone who’s studied project management will know - its processes and themes all find mirrors in everyday life. The more enthusiastic (or manic) the project manager, the more likely you are to find them applying best practice to getting their kids ready for school, or Gantt-charting their skincare regimes. We’ve looked closely at football, and can assure you - its fans, players and coaches all closely reflect elements of project management. Some people take issue with supporters referring to their team as “we” e.g. “We were brilliant!”, “We were terrible!”, “We were robbed!” and so on. “Oh,” they say, smugly, “I didn’t realise YOU were playing”. Now. Let’s imagine you’re a project manager in a meeting with your stakeholders, who all have varying degrees of involvement in the project. If one of your smaller stakeholders were to refer to themselves and the collective team as “we”, you wouldn’t call them out on it. Or, at least, you shouldn’t. Fans are key stakeholders in football. Sure, they don’t contribute to the score, but they pay for tickets and merchandise, generate extraordinary amounts of noise on social media and even cheer their team when they lose. While your stakeholders may not be present when you’re working your hardest, they’re there in spirit. Try to exceed their expectations - a good team does it for the fans. Plays, like projects, are a complex series of planned actions and consequences that adjust to situations in order to meet a goal. Just as a project should be continually risk-assessed, players must carefully analyse where they can maximise opportunities or minimise threats. A Quarterback may spot that their offensive line has let an opposing player past them. Knowing they may be crushed in a matter of seconds, they must quickly assess their options: is there an easy pass they can make? What is the likelihood of having that pass intercepted? Should they throw the ball aside, or protect it and take a hit? Many will choose one of the latter options to prevent the opposition taking the ball, because they know a lost play does not equal a lost game. Players and project teams should keep their end goals in mind, and know which small defeats to take in order to reach them. If you think your project team are difficult to manage, try getting 53, 6’2”, 247lb athletes* to follow your instructions, work together AND succeed against 31 other teams. According to the National Collegiate Athletic Association, only an estimated 1.5% of college football players make it to the NFL. So, if you can be selective about your team, you should – the best people achieve the best results. A coach, like a project manager, is a keen multitasker. They consider their players’ attitude, aptitude and subsequent likelihood of winning. They also manage the expectations of the owners, fans and sponsors, who have all invested their time and money in the project’s success. Great coaches and project managers train themselves and their team in their objectives and processes, learn more as the game progresses, and clearly communicate their objectives to achieve results. If you’ve worked on projects, or been part of a sports team, you’ll know that collaboration is key. The best managers consider their goals in tandem with their team’s abilities and motivations. To do this, they often introduce a common methodology that they and their team can follow as a unit. PRINCE2 is a controlled, consistent approach to projects that allows you to logically plan your tasks and objectives. We guarantee** the winning team this weekend will be using PRINCE2 processes – so if you haven’t implemented them in your organisation, click here to see why you should! * This is the average height and weight of an NFL player. For average athlete sizes per sport in the U.S., they’re topped only in height by NBA players. The heaviest NFL player in history is offensive lineman, Aaron Gibson, whose highest weight was an incredible 410 lbs – imagine the risks involved in playing against that! ** Ok, maybe not consciously – but they ought to.